American Fan, Lau Industries, Clarage, Delhi, Canarm, Leader Fan, Daltec, ABB, Flakt, Flaktwoods, Woods, MK Plastics, Robinson Industrial, Garden City Fan, Loren Cook, Jen-air, Jenn Fan, Aeroflo, Grainger fans and blowers. Industrial fans, blowers, ventilators, high pressure blowers, high temperature ovenfans; and wall / roof exhuast ventilators. Manufacturers and distributors of industrial process and commercial air-handling units AHU, fans, blowers and ventilators. 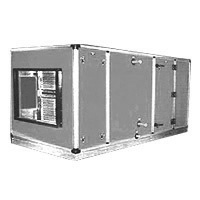 to match the customer air handling capacities requirement utilizing the computerized selection for each component. We use premium quality industrial-grade materials and additional protective coatings for external surfaces and internal components of our Air Handling Units - to withstand the specific gases flow and the installation conditions of each air-handling application, industrial and commercial / institutional. Up to 100,000 CFM od air supply for standard construction and larger, custom made on special request. Every airhandling unit is designed for the specific installation and ventilation conditions. The unit floor area and its cross section dimensions are adjusted for precise room available at site. Packaged compact or sectional AHU design provided with lifting arrangement and protections for easy transportation and handling / installation at site. Service friendly design which provide large room inside cabinet, access doors, light and rigid floor ensuring accessibility to all AHU components. Fans, coils, motors, humidifiers, filters, external insulation material, silencers, enclosure tightness, and other components are carefully selected and engineered for lowest energy consumption. Safety devices and guards are provided in accordance to the international regulations and the customer specific requirements. Buffalo Blower makes two primary gas-fired AHU types: direct gas-fired and indirect gas-fired airhandlers. A direct gas-fired AHU airhandler has a gas burner installed directly in the outside makeup-air stream. The products of combustion (carbon dioxide [CO2], carbon monoxide [CO], nitrogen dioxide [NO2]) are discharged directly into the makeup air stream and supplied to the building area. An indirect gas-fired AHU airhandler has a sealed combustion air chamber where all products of combustion are discharged through a flue to the outside environment and no products of combustion are discharged within the make-up air supplied to the building. Such equipment also frequently is utilized for recirculation air applications. Though simple in principle of operation, direct gas-fired air-handling units AHUs have sophisticated burner-control systems. Unit fan sizes range from 1,000 cfm with a heating capacity of 80,000 Btuh to 100,000 cfm with a heating capacity of 15 million Btuh. Direct-gas-fired-AHU components usually include housings, air supply fans and blowers, outside air intake air hoods, intake air dampers, ventilation filters and blower burners. AHU fan housings are made of galvanized or aluminized steel. Access panels are provided to access dampers, filters, burners, and fans / motors. AHUs located outside are provided with a sloped roof and standing seam joints. Fans typically are double-width double-inlet (DWDI) ventilators with forward-curved or backward-inclined fan wheel blades. Fans can come with open drip-proof (ODP) or totally enclosed fan cooled (TEFC) motors. The most typical external static pressure in the 2- to 3-in.-wg range. Because most outside istalled air handling units can operate below 0°F, fan motors and bearings are rated to handle lower temperatures. For applications that require supply-air temperatures higher than 110°F, the motors and fan bearings are rated for maximum design operating temperatures when placed in draw-through configurations. Outside air intake hoods or weather hoods are designed for an installation specific location and usually provided with bird screens. Outside-air intake isolation air dampers are furnished to prevent cold air from dropping through a unit into a warm building and warm air from escaping through a unit during winter months, when it is not in operation. Low-leakage parallel blade isolation air-handler dampers are most standard. The fan discharge is located at the opposite to isolation-damper position. A filter cabinet normally has 30/30 filters in a V-bank configuration to increase filter area and reduce static-pressure drop across the filters. Higher-efficiency filters are used on application. A burner consists of a cast-iron or aluminum pipe assembly with drilled gas orifices. The fuel-air mixing is controlled by perforated stainless-steel baffles attached to the pipe assembly. The burner blower can be placed in the outside airstream or in the outside / return mixed-air stream. But to prevent potentially hazardous combustion byproducts of indoor-air contaminants, the burner is placed in the outside airstream only. The required airflow across the burner must be within a specific velocity range (typically 2,500 to 3,500 fpm) for proper combustion. For variable airflow air handling units, a modulating bypass damper or profile plate maintains the airflow velocity of the airhandler within the specified velocity range. Otherwise, the burner blower can experience inefficient operation, generate odors in the occupied spaces served, and create an un-safe increase in certain products of combustion. Buffalo Blower. © 2009 All rights reserved.